This Saturday night at UFC 235, the welterweight title will be on the line as the champion Tyron Woodley defends against Kamaru Usman. In Woodley’s last time out, he successfully defended his crown against Darren Till at UFC 228. A fight that many expected to feature the, at the time, interim champion Colby Covington. Covington’s last fight came at UFC 225 when he won said title by picking up a unanimous decision over Rafael Dos Anjos. Now having lost his interim title and immediate title shot, Covington’s future in the UFC is in question. Never one that is shy to share his feelings on things, or Covington specifically, Ben Askren shared his thoughts on Covington’s current situation. “Colby’s got no skills,” Askren told media on Monday (via MMA Fighting). “He’s gotta fight… If he doesn’t fight, I don’t think one person in the whole world will shed a tear. Like, thank god that era is over. I think the UFC made it more than it was, because if you look at any of his social media he doesn’t have that many followers. There was never that much of a ‘We want to see Colby!’ It just wasn’t there. It was staged. 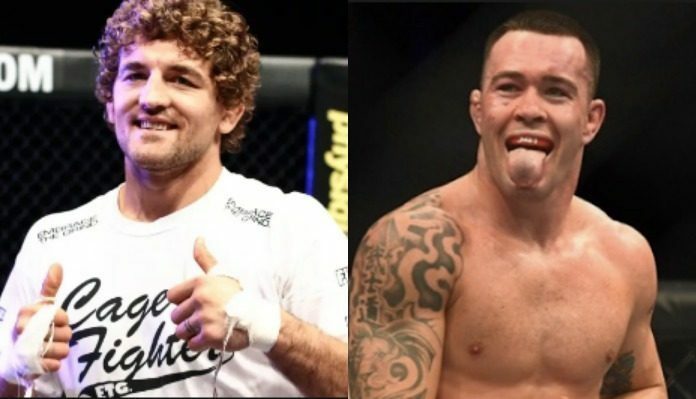 Askren and Covington have had some brief back and forths on social media and thrown jabs at one another in interviews so it’s been made clear that they aren’t fond of each other. Whether or not Covington will end up getting the title shot he’s waiting for in his next fight remains to be seem. Woodley’s teammate in Askren thinks it would still make sense, however. For the unbeaten 18-0 former ONE Championship and Bellator champion, Askren, he makes his promotional debut this Saturday night at UFC 235 opposite Robbie Lawler.